Last week, the husband and I decided two things: 1. Our deck looks like crap, and 2. If we put forth a little effort and money, we can make it look less like crap. We suspect the deck was constructed by the previous owner. Nothing was pre-fabricated, including the lattice. Imagine two finishing nails at every intersection. The lattice has been falling apart for a while, and the past couple years the paint has deteriorated all over. It’s to the point that if we don’t do something, the wood will rot. So, we planned Operation: Deck Refinish. Step 1: Sand off the flaking paint. This has mainly been my job, as the husband has been crazy busy at work. No big deal, I thought. He has a little electric sander for the rails and smaller components. We plan to rent a big one for the floor. Today was day 2 of my sanding efforts. Last night, the husband took down all those skinny rails so I could sand and paint them at one time. My plan for today was to finish sanding the standing structure and then move on to the skinny rails. I woke up sore from yesterday’s sanding efforts. When you see the size of the sander, you’ll wonder how that’s possible. See that little yellow thing? That’s the sander. I hate it a little bit. The sander isn’t hard to use. You have to change the paper when the current paper loses it’s grit, which depending on what you’re doing, has to happen every 15-30 minutes. Plus, you have to exert a little pressure. And maybe hold your hands over your head. And keep working that one area because the paint just won’t come off. Do this over the course of several hours, and your muscles start to rebel. Remember how the title said something about book editing? Imagine your finished first draft is the maintenance-needing deck. The structure is sound, but it has some issues – extra words, inauthentic dialogue, whatever. Those are the paint covering the story, and the paint could use some work. 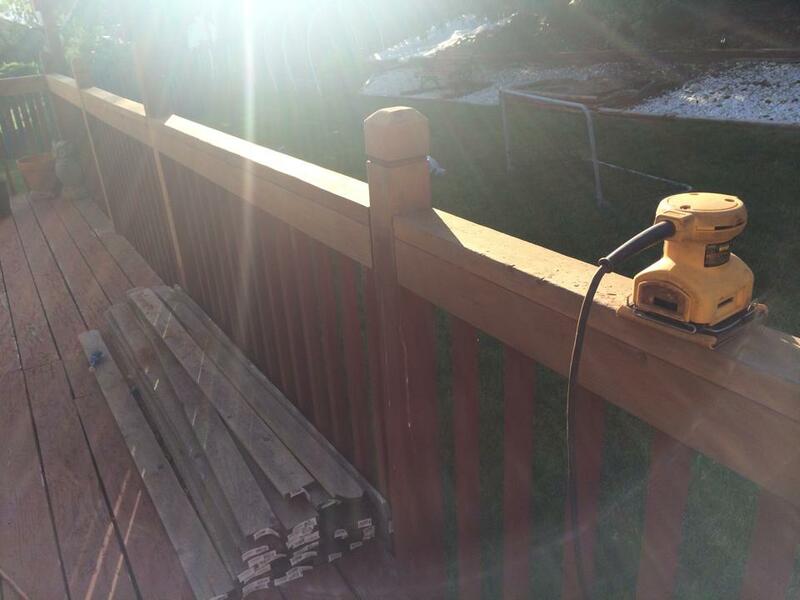 Start by sanding away the extra junk, the stuff that keeps you and others from seeing the beauty of the deck. It could be overused words. We all have our favorites – paste your work into ProWritingAid to learn yours. I tend to lean on “about”, “could”, and “maybe”. Granted, many of these words occur in dialogue and therefore receive a little grace, but still: tread with caution. It could also be overused punctuation, like the maligned semicolon. Now, I like semicolons. 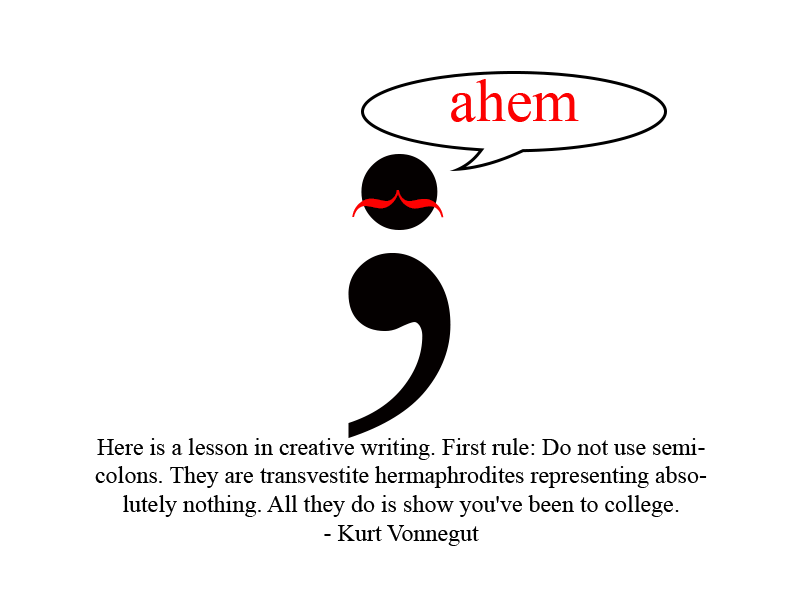 They relay the connection between two independent clauses more effectively than a period. But there has to be a connection for that to work. Remember the famous Vonnegut quote about semicolons? That’s a little harsh, but they can be distracting if you use too many. One of my critique partners said I was overusing them. He even went so far as to point out where the relationship wasn’t strong enough to warrant one. Know what? He was right. I changed several to periods. Another one to watch out for is exclamation marks. My editor got after me for this one. According to my publisher’s style guide, the MS should have no more than ten exclamation marks in total. So I had to go exclamation mark hunting. I cut all but eight and ended up putting a couple back because I lost my ten-year-old character’s voice a little. She’s easily excited. While I was editing, I can’t say I liked my critique partner or my editor very much. They were the sander in this metaphor. They made the job easier in the long run (because I learned to limit semicolon and exclamation mark use while writing that first draft from then on), but in that moment, they made my back hurt and annoyed me with their frequent need to have their paper changed. The point is, this stage of editing can be painful. You’ll have to sand off a lot of junk, and it will take a long time. In the end, you’ll likely have the same structure, but it will be cleaner overall. The next stage of the deck project is painting. That sanded wood needs a fresh coat to keep it protected from the elements. Sure, we could skip it and just admire the nice wood – the structure will stand either way, at least for a little while – but the project wouldn’t be finished. Let’s consider this piece the “revising” part of editing, where you take “meh” sentences and give them more punch. You add more tension to that scene where the MC is fearing for his life. You amp up the drama when the lover leaves for what the MC thinks is the final time. You fix the dialogue that doesn’t sound natural. You trim that part with a little too much scene description. Critique partners and beta readers are crucial for this step. They’ll tell you (or they should tell you) when something doesn’t make sense, or could be more powerful, or is boring. Revise accordingly. There is one other piece that may arise in the editing process. But let’s go back to the deck for a minute. There’s one board in the floor that may be beyond repair. It’s mushy when we step on it and is likely rotted through. Our only option is to replace that board. Sometimes rewrites are needed. Hopefully you’re beyond this point by the time your book reaches betas, but you never know. In front of fresh eyes, something might not work the way you think it does. You might have to replace (rewrite) a scene. 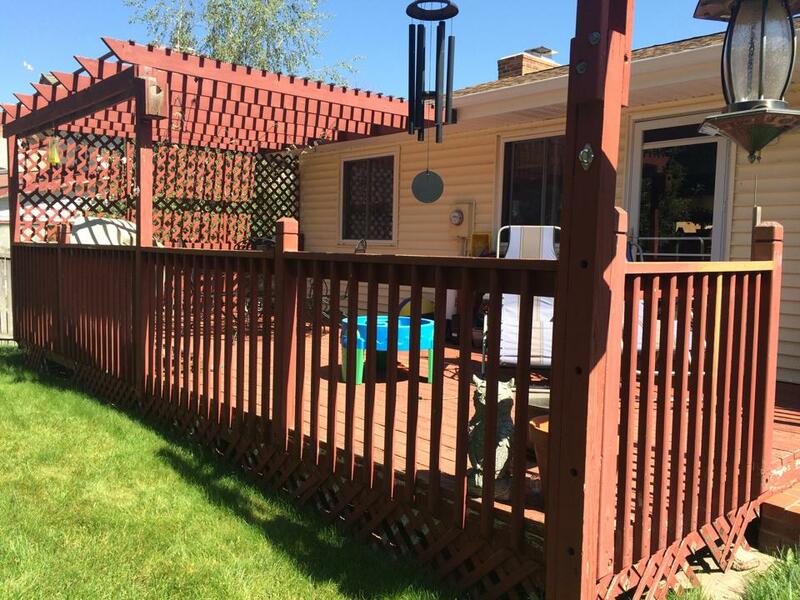 When all is said and done, the structure of our deck will look the same as it did before we started the project, but it will be something we’re not embarrassed about when friends come over for a barbecue. It will be clean, free of broken pieces, and we can take pride in knowing the pain and hours of work were worth it. I hope that last sentence applies to our writing as well. Do We Need A Little Adversity? ← I’m Not Stressed, Dammit! What a great analogg! Not quite at the editing stage yet, sander makes me think of delete. Such a useful key. Even now. No idea what analogg is, irony, where’s that delete key again. Allison, loved your comparison; I ‘resanded’ my first novel before working on my third. Funny how your writing technique picks up quality as you continue on. Anyway, some writers say they don’t read their books once they’re published; curious what your practice is – ever read your own book and discover something you’d like to change post publication? I’ve changed a couple minor things – like I realized while editing a different book that I have another crutch word, so I removed some of those in the published book and posted an update. The average reader would never know the difference. I really can’t look at it again because I’m one of those who will never leave it alone. Was your first novel published when you resanded it? (D) Accidentally dropping a lit match onto the paint remover you thought was needed after spilling it onto the deck. 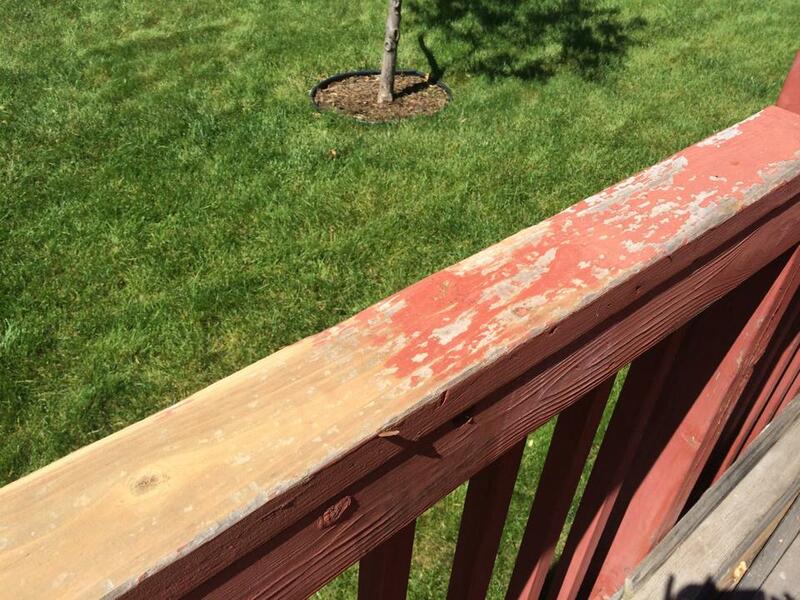 My dad used to punish us as kids by making us sand our and stain our deck. Hello, paver stones at every house I’ve owned since. The heat isn’t terrible, thankfully. Getting the paint down early enough for it to dry before afternoon storms will be the trick. Afternoon storms sounds like a good reason to put this task off for a while.